When you get divorced, it important to understand that Texas is a community property state. Community property is a legal term that basically means a court will consider all property acquired during the course of your marriage as community property. That means your spouse will likely be entitled to a portion of your assets, including your 401(k) retirement account, any 403(b) plans, individual retirement accounts (IRAs), pension plans, stock options, and so forth. If you and your spouse acquired or contributed to one or all of these retirement and investment accounts, they are likely going to be subject to equitable division under community property principles. During a divorce, you are required to transfer different accounts in different ways, depending on the type of account. For example, during your divorce, a 401(k) plan, 403(b) plan, and/or pension plan must transferred through a Qualified Domestic Relations Order (QDRO). A QDRO is a court order that you must provide to the administrator of your retirement plan. The QDRO instructs the retirement plan administrator to recognize an “alternate payee” (i.e. your spouse or you, if you are receiving a portion of your spouse’s retirement plan) to receive a portion or all of the benefits of the retirement account. A retirement plan administrator has the discretion to accept or reject your QDRO. In most case, if properly written, an administrator will accept the QDRO within 90 days of receipt. However, if the QDRO contravenes the underpinnings of the retirement plan, or is vague, the administrator may reject the QDRO. 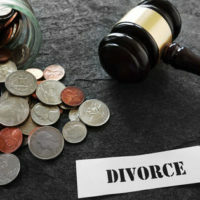 This is a big reason why it makes sense to have an experienced Houston divorce lawyer working for you to draft a detailed, legally-valid QDRO that both the court and a retirement plan administrator, will agree to. If you are receiving a portion of your spouse’s retirement plan, you typically have an array of options on what to do with the funds. For example, you can leave them on deposit with your spouse’s retirement plan, you can roll the account over to your own IRA, or you may simply withdraw the funds (but watch out for early withdrawal fees and taxes). The choice is ultimately yours. If the retirement plan is run effectively featuring a well-diversified portfolio of investments, then it may make sense to simply leave the funds in the plan to continue growing. However, if you are not impressed with the plan’s management, or you are in need of the funds immediately, you should explore moving the funds elsewhere. As you can see, properly dividing retirement and investment accounts can get quite complicated. This is why you need the experienced Houston divorce and family law lawyers at Lindamood & Robinson, P.C. on your side. We will take the burden off of you to investigate your spouse’s retirement and investment accounts and will draft a thorough, legally-valid QDRO. You should focus on putting the pieces of your life back together. Let us handle the paperwork. Contact our office today to schedule a meeting with one of our lawyers.